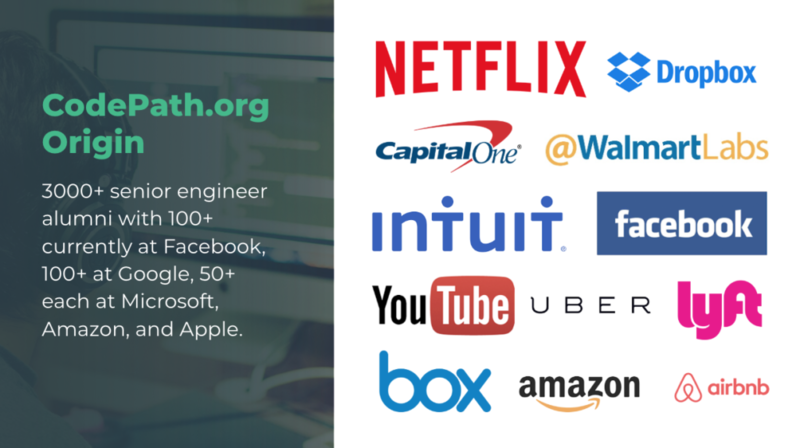 CodePath.org started as a coding bootcamp for senior engineers that ran training and onboarding programs for many of the world’s top technology companies including Facebook, Dropbox, Airbnb, and Netflix. Over 5 years, we created 30+ courses, taught over 3000 programmers; from community college students in Oakland, California and high school students in Haiti to senior engineers at Microsoft and Google. Our singular focus was to create a better way for engineers to develop expertise in new technologies where documentation was often spotty, out-of-date, and inaccurate. Talent is Everywhere. Opportunity is Not. Teaching thousands of engineers across dozens of leading technology companies allowed us to compare engineering proficiency across companies. We learned that many talented developers were undervalued and often the engineers that we thought were the best based on the hundreds of hours of project work that we graded, had low ranking resumes or didn’t perform well in traditional technical hiring screens. The degree to which engineers were overvalued tended to correlate with pedigree and that engineers from non top tier schools or who were underrepresented were consistently the most undervalued. What did correlate strongly to our rankings and future work performance was a combination of grit, work ethic, completion bias, and the level of curiosity and passion for the technologies being taught. Engineers that were undervalued tended to have weaker work and educational experience even if they completed the course at the top. We prioritized supporting these underestimated engineers because we wanted to see as many engineers as possible reach their potential. Supporting the engineers in our program that had high grit and work ethic but weaker experience meant creating comprehensive support systems and selecting cohorts of students with similar technical gaps. When we shifted to every student starting with a similar level of knowledge, it became much easier to optimize content and curriculum pacing for to produce more consistent and better outcomes. About 3 years ago we were asked to redesign Facebook University, Facebook’s flagship internship program for underrepresented college freshman. We learned that the programming courses we developed to teach professional engineers provided a missing and desperately needed curriculum and layer of support for underrepresented computer science students to persist and succeed in tech. As underrepresented entrepreneurs and startup founders from disadvantaged backgrounds, we saw an opportunity to greatly impact the quality and size of the funnel of underrepresented software engineers by putting our curriculum for experienced engineers directly on college computer science programs. Most students fall in love with engineering based on a chance encounter with a friend or relative passionate about programming or being lucky enough to find the right mentor or teacher at the right time. Our vision was to integrate our programs into existing CS education in a way that would create more great software engineers by design. CodePath.org is now transforming college computer science education across the country and doubling in size every semester. We exist to empower every person to change the world through providing world-class computer science education.